SWORDS, Ireland--(BUSINESS WIRE)--Ingersoll Rand (NYSE:IR), a world leader in creating comfortable, sustainable and efficient environments, announced that it has achieved a significant milestone in its global Climate Commitment ahead of schedule and is deepening its commitment with on-site and off-site renewable energy investments. As part of its global Climate Commitment, Ingersoll Rand committed to a 35 percent reduction of its greenhouse gas (GHG) footprint from its own operations by 2020. To deliver on this goal, the company targeted a 10 percent increase in energy efficiency from a 2013 baseline – and has achieved the goal two years ahead of schedule1. Ingersoll Rand conducted an energy audit of its own large facilities and upgraded air conditioning systems, building controls and lighting, and eliminated energy leakage from its compressed air systems while measuring, validating and reporting the results. It reduced energy use by 109,000 MM BTUs and electricity consumption by 22,000 MWh, which is the equivalent of not burning 26 million pounds of coal and powering 1,750 homes for one year. The company announced investments in renewable energy technologies to deepen its Climate Commitment and reduce its impact on the environment. At three large manufacturing sites in the U.S. and China, Ingersoll Rand initiated or commissioned on-site solar installations to address 15 percent of the energy load at these locations. This is equivalent to saving 560,000 gallons of gasoline and taking 1,000 cars off the road. In addition to on-site renewable energy sources, Ingersoll Rand has signed a power purchase agreement (PPA) for approximately 100,000 MWh of wind power annually. The wind farm is in Baylor County, Texas. The PPA replaces 32 percent of the company’s U.S. electricity use with green energy, and reduces U.S. Scope 2 GHG Emissions from Electricity by 32 percent. This is the equivalent of recycling 26,000 tons of waste instead of sending it to a landfill, and preserving 600 acres of U.S. forests. Leaders from the company shared the news at the Rocky Mountain Institute’s Business Renewable Center (BRC) annual event in Jersey City, New Jersey last evening with representatives from 100 member companies. BRC is a membership program of Rocky Mountain Institute that provides educational support for buyers, developers and intermediaries to accelerate the market for corporate renewable energy procurement. 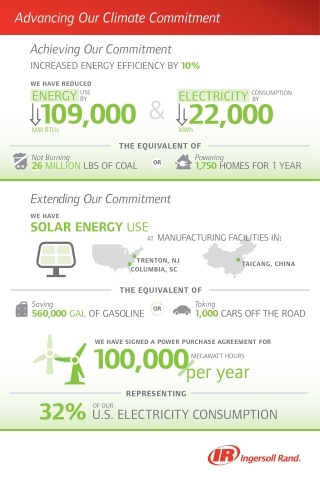 To date, BRC members like Ingersoll Rand have contracted for more than 10 GW of new, renewable energy.